Yesterday I visited the Queensland Brain Institute at St Lucia, Brisbane, where Dr Adam Hamlin showed me around the laboratory on the campus of the University of Queensland. 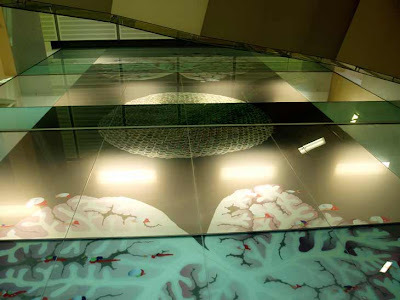 The picture above shows the three-storey tall mural in the foyer of the building, created by artist Fiona Hall. 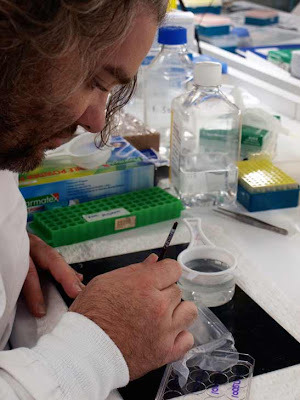 Frocked up in a stunning white lab coat, I watched Adam as he prepared slices of mouse brains for staining and mounting on slides. 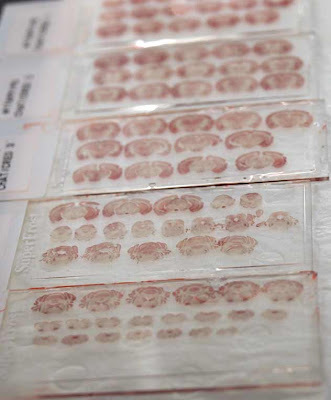 A mouse brain is less than a centimetre across, and it is frozen and cut into very thin slices using a special blade. The slices are 40 microns thick – about 1/25 of a millimetre – and Adam picks them up using a fine paintbrush to move them from one solution to another. Preparing the slices for staining and mounting takes five days, so I only got to see the beginning of the process. At the end of of that time, Adam will have a set of slides that look something like the ones below. The red stain is attached to amyloid plaques that form in Alzheimer's disease, and under the microscope Adam can see the plaques and the swelling of nerves that are affected by them. Adam's currently supervising a PhD student, Lavinia, who showed me some gorgeous images of neurons being born, growing and migrating in the brains of mice that had had strokes (ischemia). Then MRI technician Marianne let me watch as she sedated a mouse and popped it into a Magnetic Resonance Imaging (MRI) machine -- making sure I didn't have my watch or my credit cards anywhere near the 16-thousand-Tesla magnet. At the end of a day at the QBI, I felt I had learned so much new information that my synapses were popping! On the plus side, all that stimulation of my neurons will help keep more of them alive for longer. And I've got a million more ideas for my embroideries.